Elizabeth Is Missing is a wonderfully bizarre thing. Not only has Emma Healey delivered an alluring mystery, but a sincere of depiction of family life in the face of illness. Our 84-year-old narrator, Maud, who's, ironically, not to be forgotten, suffers from dementia (a theme Healey deals with in a remarkably realistic and honest manner). And yet, despite Maud's inability to remember simple daily tasks, the one thing she remembers is something everybody else has forgotten: the answer to a seventy-year-old crime case. MY THOUGHTS: If you've ever known anybody who has dementia, you'll be shocked by how frightfully realistic Maud's narrative is. And not only this, but Healey depicts the complex relationships Maud holds with her family and friends (notably her daughter, her granddaughter and her carer) with complete sincerity. Even without the mystery aspect, ELIZABETH IS MISSING could succeed alone in its realism and gritty study of human relations. The mystery itself is a fascinating one, told through alternation between Maud as she is now, and Maud as she was in her youth. The 84-year-old Maud is convinced of her friend Elizabeth's disappearance, whilst the young Maud is dealing with the disappearance of her sister Sukey. These stories run hand-in-hand, and, unlike many other reviewers, I really loved the disjointed switches between the two – it's almost as if this is to echo the confusion of Maud's mind and memories. Perhaps my favourite detail of this novel is that, more than anything, it's about a personal conflict. Maud isn't solving the crime for the sake of solving a crime – heck, she doesn't even know what's happening half of the time. Instead, what Healey presents is far more complex and enthralling. What if your mind is the only thing that prevents you from figuring out the one thing you want to know? That's exactly Maud's predicament. The only flaw I can find within in this novel is that, occasionally, confusion can be found – especially when it comes to tying together all the loose ends. 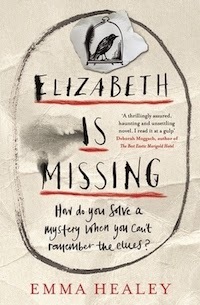 But, overall, darkly humoured, well-plotted and told through an accurate and compelling narrative, Elizabeth Is Missing is nothing short of fantastic. I truly recommend. There was something strangely captivating about the narrative. The tale itself was powerful and irresistible, and I found myself both gripped and moved by this 82-year-old's battle against her own mind. It's a thoroughly compelling read. My sister just got this for her birthday so I think I'll definitely give it a go at some point seeing as you liked it. It seems to be an interesting enough concept so hopefully I'll enjoy it. I hope you (and your sister) enjoy it! This certainly does sound like a compelling read. I'm intrigued by the way the two narratives interact with each - I'd like to see how they further the storyline yet still manage to reflect Maud's jumbled thoughts. I've been seeing a lot of wonderful comments about this book, it truly does sound compelling! It has had such a positive response! It truly is wonderful. I've heard a bit about this book but not much. I'm so happy you did a post on it. Now I really want to read it. I hope you get round to reading it at some point!